Neos Kosmos archive photo collage from a past FYROM community rally in Melbourne. Fyromians were carrying banners presenting Greece as a pro-Nazi nation, maps of Great Macedonia while chanting mottos like “Thessaloniki will be our capital”. One of the most recent rumours to surface on Facebook in the past 24 hours wants a group of Melbourne Greeks crashing FYROM’s protest on Sunday 4 March. Said group, according to Facebook comments, is planning a counter-march at the same time Fyromian Australians will be rallying. The members instigating this action state that “as Australian citizens we have every right to stand outside Parliament House holding Australian flags and protest against FYROM being named ‘Macedonia’ as Fyromians protesters want. We held our rally last week but did not offend anyone while since then there have been many offensive and derogatory anti-Greek mottos on the Internet and on the streets”. This initiative has alarmed several representatives of the Greek Australian community of Melbourne, not to mention officials, who are trying to prevent the counter-rally for fear it could result in a violent clash between the two ethnic groups. Panagiotis Kaliakoudis (Peter Kalla on Facebook), regarding the counter-rally wrote on Facebook: “After years of racial abuse and vandalism by the Slavic fraudsters the Greeks have had enough. Last Sunday 30 riff-raff vagabonds of the Bulgarian kind rolled up to spoil the Greek march the same leaders who tried to spoil an earlier rally 5 weeks ago. A phalanx of 300 stand up men named in honour of Leonidas I & his immortals are preparing to demonstrate their Democratic rights as citizens of this nation to support our government’s non recognition of Fyrom. “I am Macedonian I am Greek”, he wrote at the bottom of his post. Neos Kosmos asked Mr Kaliakoudis if the above mentioned group of men will be crashing the FYROM rally in spite of the community’s wishes to stay away from Palriament House on Sunday and he has confirmed it insisting “that this is a constitutional democratic right we are entitled to as Australian citizens”. Solicitor and author Konstantinos Kalymnios also advised young Greek Melburnians to not attend FYROM’s rally as such an action opposes to the Australian multiculturalism spirit. 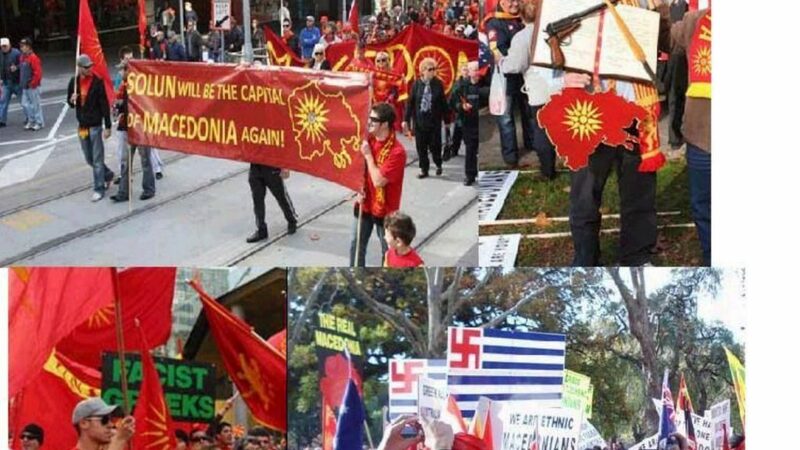 The president of the Pan-Macedonian Association of Melbourne and Victoria seconded the warning urging Greeks to respect the right of the FYROM people to protest. Neos Kosmos does not condone such actions either; we strongly advise our readers to distance themselves from such initiatives.